How is it almost the end of February?! Complete the intended recipe-list spreadsheet. Art designs are still in progress. I’ve got pencils down for the first wallpaper and I’m just tickled with the way my Short-Order Ogre came out. 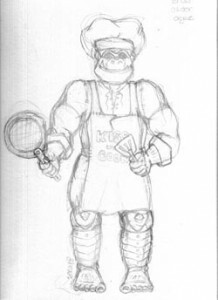 Sure, he’s a little more Dreamworks than D&D but I’m not sure I’d want the ogre from the Monster Manual cooking me breakfast, would you? Pencils are always the hard part for me, they take the longest so I think I’m well on my way to having the first wallpaper complete in the upcoming week. Speaking of this week, it’s going to be pretty busy: I’m hosting a wedding shower on Saturday so just keeping some forward momentum is going to be challenging. It does mean that I’ll be able to test several recipes (at least 4!) for yields and actually measure the bits I do by habit. And for this reason I’m not going to create a new to-do list, just keep up with the current one and not push it. What did you think of the menu suggestions for Shadowrun, last week? I had a blast learning about the game and thinking them up! This week we’re going Arabian Nights with the AD&D 2nd Edition Al-Qadim manual and I’m thinking a bit of Moroccan flair is called for!